In accrual accounting, a deferral is any account where the asset or liability is not realized until a future accounting period. A deferral refers to the delay in the recognition of an accounting transaction. These accounts can include annuities, charges, taxes, or income. A deferral can also been seen as a prepayment of an expense or revenue. As it is prepaid, it is not immediately recognized on an income statement and is instead deferred to a balance sheet account to appear on a later income statement. Deferrals occur as a consequence of revenues being recognized in the period in which they occur, and expenses being recognized in the period in which they are incurred. Thus, adjusting entries are needed to reconcile cash flow with events that have not yet occurred as either assets or liabilities. Deferred expenses (also called prepayment, prepaid expense or prepaids) are transactions where cash has left the business or organization, but the event has not actually occurred yet. Prepaid expenses, like insurance payments, are the most common type. Deferred revenue (also called deferred income) is income that has come into the business or organization for an event that has not yet occurred. It is unearned revenue and is recorded as a liability, and the business or organization still needs to produce the goods or services before the revenue can be recognized. An example of this would be a monthly subscription for an ongoing service. Accruals and deferrals can sometimes be confused, and there can be accruals and deferrals for both expenses and income. The main difference between the two ideas is that an accrual occurs before a payment or receipt, while a deferral occurs after a payment or receipt. Deferrals are commonly used by businesses and organizations to get more accurate financial picture. A key to successful accrual accounting is to record deferred revenue—this allows your company to recognize revenue at a time that best matches cash income with the expenses incurred while generating that income. Because deferred revenue is an accounting strategy that that does not recognize revenue immediately upon receipt, your company is able to see a more accurate long term financial picture. Shifting from one-time large cash events to deferred revenue can highlight how contracts or departments are contributing to long term growth and profitability. It is important to not offset deferrals or deferred revenue with accounts receivable. 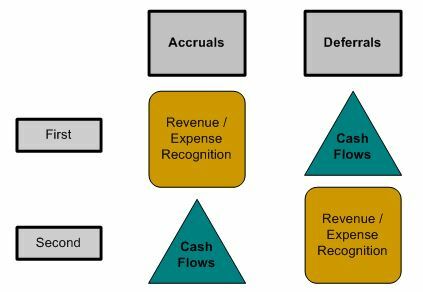 Recording an entire contract value in accounts receivable and deferred revenue to show potential economic impact and present worth to the business is not in accordance with GAAP (Generally Accepted Accounting Principles).